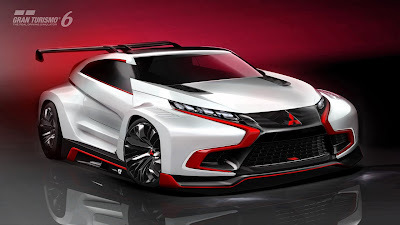 Mitsubishi Motors, a company with a spectacular history in races like the Dakar Rally and World Rally Championships (WRC), has developed a special concept model for Vision Gran Turismo: This is the "Mitsubishi Concept XR-PHEV Evolution Vision Gran Turismo". The styling of the car follows the basic concepts of the "MITSUBISHI Concept XR-PHEV" shown at the 2013 Tokyo Motor Show, while pouring in know-how gained from years of motorsports experience into its every detail. The result was the evolution of the concept into a stoic racing machine. The "Athlete Form" design concept was advanced further, emphasizing the driving features aggressively. The iconic front grill is a study of next generation Mitsubishi automobiles, and the shape that forms a wedge starting from the triple diamond mark is designed in the image of an athlete at crouching position on a starting line, evoking an intense image of tension and potential. Utilizing advanced development technology from the Plug-in Hybrid EV System, the spontaneous power of the motor and powerful torque of the engine is transmitted through an 8 speed dual clutch transmission (DCT) to drive the 4 wheels. It's overwhelming drive performance is controlled precisely with the S-AWC vehicle dynamics control system that distributes the drive force optimally to the 4 wheels, producing a handling characteristic that moves the car exactly as the driver desires.